WikiLeaks Founder - Julian Assange : Evil Hacker or Visionary Hacker ? Who is Julian Paul Assange ? He is, of course, the lean, tall, and pale 39-year-old Australian master hacker at the white-hot center of the whistle-blowing website WikiLeaks and, after revealing thousands of secret Afghan battlefield reports this week, the subject of investigation by U.S. authorities. By now we've heard quite a bit about the Assange mystique and his cutesy-named website. WikiLeaks devotes itself to obtaining and posting secret government documents and information from unidentified sources. With WikiLeaks' heightened profile, stories about Assange have appeared recently in several publications, on TV, on the Internet, on cable, yet he remains one of the most elusive and enigmatic figures of the moment. Julian Paul Assange is an Australian journalist, publisher, and Internet activist. He is best known as the spokesperson and editor in chief for WikiLeaks, a whistleblower website. Before working with the website, he was a computer programmer. He has lived in several countries, and has made occasional public appearances to speak about freedom of the press, censorship, and investigative journalism. Assange founded the WikiLeaks website in 2006 and serves on its advisory board. He has been involved in publishing material about extrajudicial killings in Kenya, for which he won the 2009 Amnesty International Media Award. He has also published material about toxic waste dumping in Africa, Church of Scientology manuals, Guantanamo Bay procedures, and banks such as Kaupthing and Julius Baer. In 2010, he published classified details about United States involvement in the wars in Afghanistan and Iraq. Then, on 28 November 2010, WikiLeaks and its five media partners began publishing secret U.S. diplomatic cables. The White House calls Assange's actions reckless and dangerous. With a handful of unpaid volunteers working in secret in remote places like Iceland, Assange -- with a backpack carrying not a laptop but a desktop computer -- has obtained classified material that cast a shadow on the American military, both in Iraq and Afghanistan. He rattled official Washington and its allies and drew the world's attention with the disclosure this week of 76,000 leaked classified documents from Afghanistan on its website and in the pages of The New York Times, the Guardian in Britain and the magazine Der Spiegel in Germany. In a weeklong series of press conferences and interviews from London, the publicity-savvy Assange, donning a professorial tone and Zen-like demeanor, contended that the documents showed that perhaps thousands of war crimes might have been committed in Afghanistan. "It is up to a court to decide clearly whether something is in the end a crime," he said. "That said, on the face of it, there does appear to be evidence of war crimes in this material." That is a major reason, he suggested, why he released the documents. The Pentagon struck back. Defense Secretary Robert M. Gates on Thursday called the leak a breach the military would "aggressively investigate and prosecute." 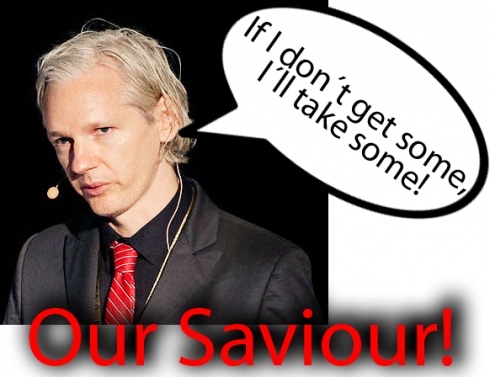 Adm. Michael Mullen, chairman of the Joint Chiefs of Staff, said, "Mr. Assange can say whatever he likes about the greater good he thinks he and his sources are doing, but the truth is they might already have on their hands the blood of some young soldier, or that of an Afghan family." Assange, who is reportedly working and living in northern Europe, has said he had no plans to travel to the United States for fear of being detained. U.S. government lawyers are reportedly looking into the possibility of charging WikiLeaks and Assange with a crime, like "inducing or serving as co-conspirators in violations of the Espionage Act, a 1917 law that prohibits the unauthorized disclosure of national security information,'' according to The New York Times. On Thursday, U.S. authorities said they had found evidence linking Pfc. Bradley Manning, 22, of Crescent, Oklahoma, to the leak of the Afghan war reports. Manning was charged in July with illegally obtaining State Department cables and disseminating a secret video, which he is believed to have turned over to WikiLeaks, showing a U.S. helicopter firing on and killing a group of civilians, including two Reuters journalists, in Baghdad. Manning, an Army intelligence specialist, has been held in Kuwait and is being moved to Quantico, Virginia, where he will be held and may face court-martial. The swirl surrounding WikiLeaks has increased the media focus on Assange. Julian Paul Assange (pronounced AH-SANJ), an obsessive hacker and computer master, is a citizen of the globe, an itinerant warrior of the cyber age, a philosopher and visionary of the encrypted universe. He has been called "The Robin Hood of Hacking," more a physicist and mathematician, the two disciplines he studied at the University of Melbourne, than a swashbuckling James Bond. His mission -- "to maximize the flow of information to maximize the amount of action leading to just reform" -- may seem grandiose and quixotic but he is said to attract a small following of volunteers and donors. In a relatively short time, he has fashioned a persona tailor-made for a media fascinated with celebrity. His life seems to be an accumulation of charming and intriguing anecdotes. Like a character out of "The Girl With the Dragon Tattoo," he is a stealth operator, living secretively and pursuing his goal single-mindedly. He moves under the radar around the world, though he seems to favor the icy countries of northern Europe. But he's no European Viking. He's a product of the Asian tropics. He was born in 1971 in Townsville in northeastern Australia. He was partly home-schooled and partly not schooled at all. By the time he was 14, he and his mother, a painter, actress and artist's model, had reportedly moved 37 times. His parents met at a protest against the Vietnam War. According to the Guardian, his father studied architecture. But the couple apparently did not marry and split when Julian was very young. His mother then married a theater director. They moved often, and when Julian was 8 years old, his mother left her husband and began dating a musician with whom she had a child, a boy. That relationship, according to a profile of Assange in The New Yorker, became abusive and they separated. Afraid that the musician would take away her younger son, she took Julian and the child and disappeared. Julian moved from city to city with her from the age of 11 to 16. A computer-smart teenager, Assange began hacking and assumed the code name Mendax, from the Latin splendide mendax, or "nobly untruthful." He joined with two hackers to form a group that became known as the International Subversives and, according to The New Yorker, they successfully broke into computer systems in Europe and North America, including Pentagon networks. Websites did not exist yet -- it was 1987 -- but hackers could disrupt computer networks and telecom systems. Assange was in his element. But his life was about to change. At 18, he fell in love with a 16-year-old in Melbourne and married her after she became pregnant. They had a son. But like his own mother, he couldn't settle down to a domestic, ordinary life. Hacking remained a grand passion. A few years later, in 1991, when Assange was 20, he and a few fellow hackers broke into the master terminal of Nortel, the Canadian telecom company. He was caught, charged and eventually tried, but a sympathetic judge let him off with a fine. While he awaited trial for three years, his wife left him, taking their son. He became so depressed he checked himself into a hospital, moved in with his mother, and slept in parks. But the worst time of his life came later, during his eight-year custody battle for his son. In 1999, a custody agreement was finally worked out. By then his hair, which had been dark brown, had turned completely white. In 2006, Assange founded WikiLeaks. He wanted to use the website as "an instrument of information warfare.'' With a fervor that would become a trademark, Assange didn't sleep for days while building the site, and he wouldn't eat. The website works in mysterious ways. It is hosted on a Swedish Internet server. Submissions to WikiLeaks are routed through a cyber maze that crosses in and out of several nations. Secrecy is at a premium. Assange and his volunteers gather documents and videos that governments and agencies keep secret and publish them on WikiLeaks.org. The site is only three-and-a-half years old but it has already made a name for itself, publishing online an archive of secret information, including Sarah Palin's private Yahoo account and the Standard Operating Procedures at the U.S. facility at Guantanamo, Cuba. In the spring, WikiLeaks released a secret U.S. helicopter cockpit video showing American soldiers killing at least 18 people, including two Reuters journalists, in Baghdad in 2007. The video ignited a debate about U.S. conduct in the war. Then on Sunday came "The War Logs," one of the biggest leaks in U.S. military history. Now WikiLeaks and Assange are famous. Assange said this week that he was expecting a "substantial increase in submissions" from whistleblowers. 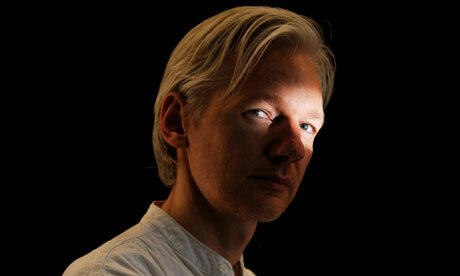 Now that he is a celebrity, Assange may find it harder to escape the media's scrutiny. For the time being he is presumably moving quietly from place to place, carrying his desktop computer in a rucksack, his clothes in a bag, finding shelter somewhere far from prying eyes, staying up all night, his fingers busily tapping on the keyboard, decrypting the next trove of secrets.